A ground breaking ceremony this morning has marked the start of construction on the first homes in the East Frame residential development. The East Frame residential development is a partnership between Fletcher Living and Ōtākaro Ltd. It spans five city blocks and will take about nine years to complete, with construction carried out in stages. The first homes will be built on on a site known as Superlot 4 - located on the corner of Hereford Street and Latimer Square. There will be 20 terrace homes designed by architectural firm Warren and Mahoney. Ōtākaro Ltd Chief Executive Albert Brantley said first 20 terraced homes were expected to be ready in May 2018, five months ahead of the original schedule. “We did take more time to get the plans right before we started physical work. We have high expectations for the development of the East Frame and Fletcher Living has risen to the challenges of getting the designs and the mixture of housing right," Mr Brantley said. “Work on the third largest public space in Christchurch is proceeding well and we expect to have it completed early next year. People can also see how Manchester Street is becoming a tree-lined boulevard. This eastern area is being progressively transformed,” said Mr Brantley. Fletcher Building Residential and Land Development Chief Executive Steve Evans said today's ground breaking ceremony marked an important milestone in the rejuvenation of the central city. “Following the development of Superlot 4 we will very quickly begin construction on two other sites. Both will feature a mix of apartments and townhouses with Superlot 7 seeing the development of 95 new homes and Superlot 11 featuring 116 homes. 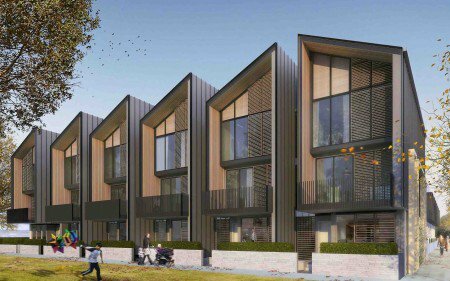 Christchurch needs more homes and we are pleased to play our part in delivering these homes," Mr Evans said.